Later this week, I'm heading out to train the senior team of a university that wants to be ready to respond appropriately if it's ever in crisis mode. We'll be anticipating a range of scenarios and finding out how each member of the senior team will respond to surprises--without knowing what the others have said. And being savvy, my client has chosen a range of issues that are front and center right now, so we'll get to think through how they might take a leadership role in responding. Understanding the limits you can and cannot set with reporters. 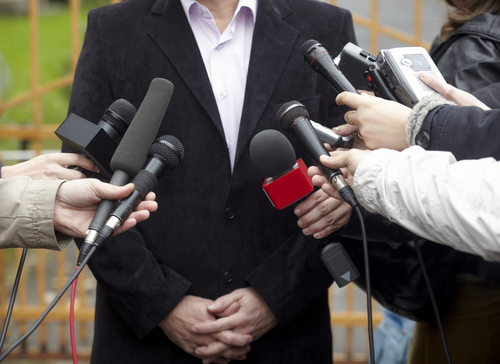 Talking into a microphone but saying it's off the record doesn't work, and you shouldn't expect it to.We'll review your role and the reporter's role in detail. Calibrating your responses to make sure you don't overreact, even if you disagree with the reporter, and that your leaders are using their "outside" voices rather than their "inside" baseball when speaking with reporters. Just how much time you have in a news story. The modern soundbite is down to about nine seconds. I use a framework for message development that will help you organize what you need to say crisply, while allowing you (or the reporter) to explore part of it in depth. Live interview practice to help you get good on your feet answering complex questions. This is really where people get caught the most, so it's the core of any training. I usually take the time to advise how you can avoid accidentally broadcasting things you wanted to keep quiet, too. Here are my suggestions for what to ask for when you're requesting a media training for today's circumstances, including social media encounters, and basic questions to ask a media trainer before you hire her. I'd love to help with one-on-one or group trainings.. Just email me at info@dontgetcaught.biz.